요세관성 산증(尿細管性酸症, Renal tubular acidosis, RTA)은 신장이 적절하게 소변을 산성화하지 못하여 체내에 산이 축적되는 일이 수반되는 질병의 하나이다. 이 부분의 본문은 말단 요세관성 산증입니다. 이 부분의 본문은 근위 요세관성 산증입니다. 일부 환자의 경우, 요세관성 산증은 dRTA와 pRTA 두 개의 기능을 공유한다. 제4형 RTA는 실제로 관장애가 아니며, 위에 언급되는 다른 종류의 RTA와 비슷한 임상적 증후군을 가지고 있지 않다. 요세관성 산증은 1935년 라이트우드에 의해, 어린이를 대상으로는 1936년 버틀러(Butler) 등에 의해 처음 기술되었다. 성인을 대상으로는 1945년 Baines 등이 처음 기술하였다. ↑ Laing CM, Toye AM, Capasso G, Unwin RJ (2005). “Renal tubular acidosis: developments in our understanding of the molecular basis”. 《Int. J. Biochem. Cell Biol.》 37 (6): 1151–61. PMID 15778079. doi:10.1016/j.biocel.2005.01.002. ↑ Lightwood R. (1935). “Communication no. 1”. 《Arch Dis Child》 10: 205–6. doi:10.1136/adc.10.57.205. ↑ Butler AM, Wilson JL, Farber S (1936). “Dehydration and acidosis with calcification at renal tubules”. 《The Journal of Pediatrics》 8: 489–99. doi:10.1016/s0022-3476(36)80111-5. ↑ Baines AM, Barelay JA, Cooke WT (1945). 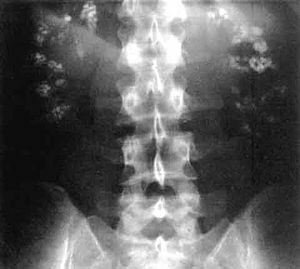 “Nephrocalcinosis associated with hyperchloremia and low plasma-bicarbonate”. 《Q J Med》 14: 113–23. 이 문서는 2017년 4월 9일 (일) 20:40에 마지막으로 편집되었습니다.